I made an homage to a 1990s card and plastic terrain kit out of Mantic Deadzone/Battlezone scenery. So far most of my hobby time in 2015 has been spent working on terrain. A lot of the work done so far has been with the modular Mantic “Battlezone” terrain (AKA “Deadzone terrain”). 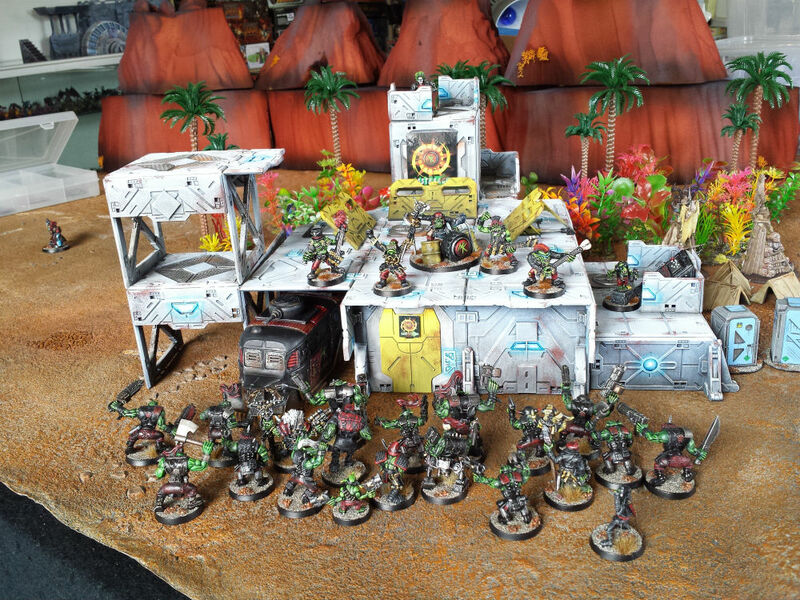 The Mantic terrain is designed to facilitate a lot of designs and uses and has a great deal of potential. The vast options available with open ended kits like those can be daunting, so I set myself a brief for one of the early projects that I tackled. 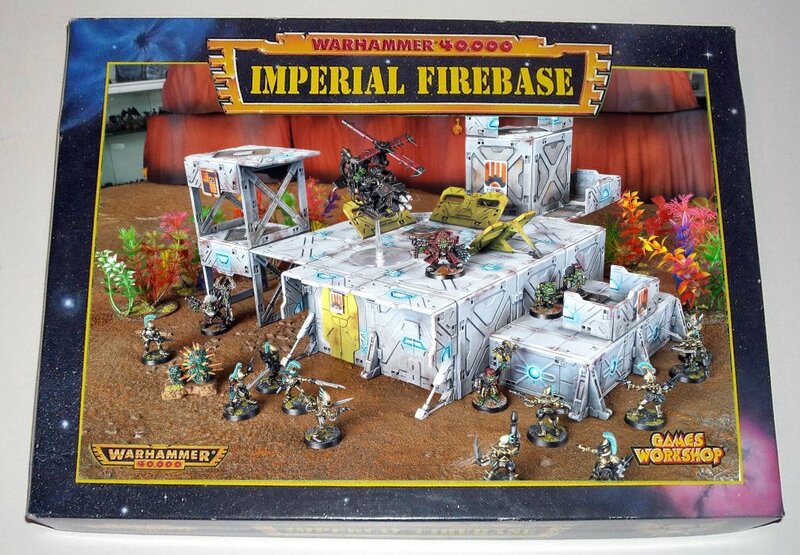 After a discussion with a fellow enthusiast about how much he enjoyed gaming over his GW Imperial Firebase back in the 90s, I decided to make an approximate replica of the old design in Battlezone pieces. A copy of the original Firebase instruction leaflet proved quite handy. 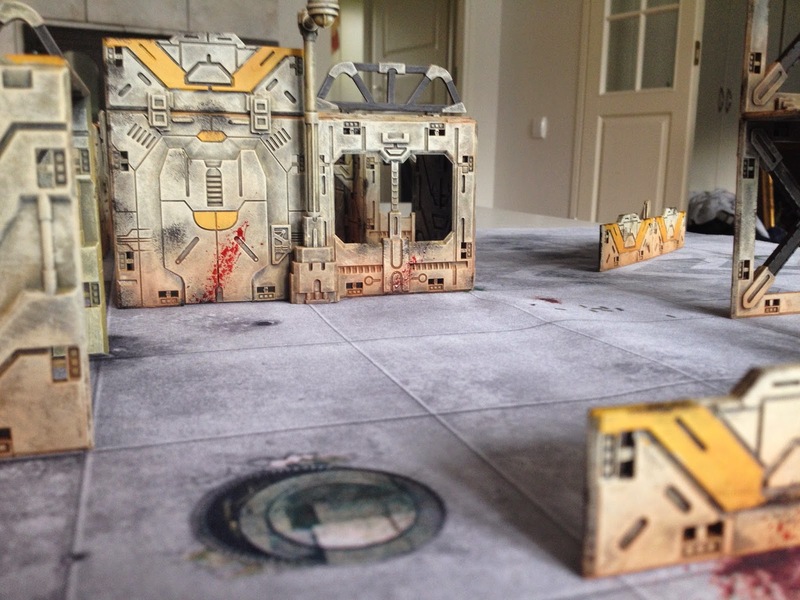 The Battlezone parts work around a 3 x 3″ pattern, just like the original Necromunda bulkhead pieces used in the original Firebase. The cardboard elements held together by the bulkheads in the original model diverge from the square grid plan a little, but it was a pretty straightforward process to approximate the layout. A couple of pieces of card in the original model didnt have anything directly analogous in the Battlezone parts, but chopping up some pieces gave simple approximates. I have put together a lot more Battlezone terrain since I assembled the Firebase. Looking back at this model now there are a couple of things that I would change in order to make it a closer match, but really they are such minor issues that I wont even go into them. Although it was tempting to paint the Firebase blue, I stuck to the overall plan for my urban sci-fi terrain (info to follow) and painted it a scruffy grey that will integrate it with the urban tabletop at a later date. I tried a little simple OSL on the “lights” but Im not sure that it was worth the bother. I should probably have been a little neater when painting the terrain overall, but as I have a lot of pieces to get through all the techniques used need to be pretty fast. I found watching YouTube videos from TheTerrainTutor helpful regarding the basics of assembling BattleZone kits in general. I approached painting my terrain in a very similar fashion to how the Esoteric Order of Gamers approached it in this YouTube video about painting the terrain. The modular signs are simple laminated printouts with adhesive sheet steel on the back attached to cheap strip magnets glued to the buildings before painting. More details on that in a later post. Despite the lukewarm critical response to goffik rokkerz Mushrööm Klöwds difficult second album, audience response to the “FASTAAAGH!” tour was overwhelmingly positive, with Waaaghstonbury proving to be a highlight. A great homage. I know sci-fi terrain has certain commonalities but you did really well considering the Battlezone kits are not the same manufacturer at all and decades newer. That last photo is killer by the way. “Waaaghstonbury”? Can you imagine how nasty the toilets at that are? Thanks NSA. Translating the design was quite simple really, but its was quite pleasurable. 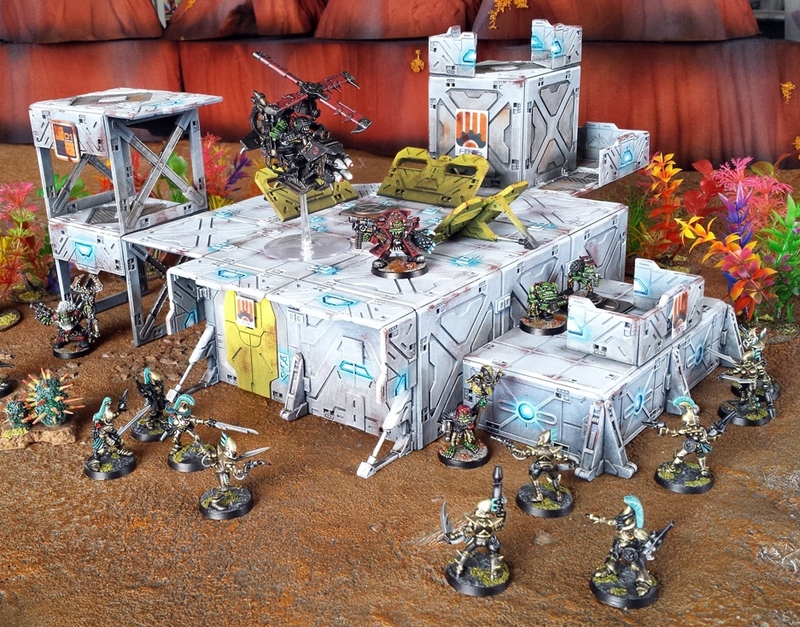 It was gratifying to get a game in on the Firebase this weekend and to find that the layout made for some fun manoeuvring in the skirmish games that I favour. Yeah I thought the box art re-do was a nice touch too. Semi-replicating the image on the box art was a bit of fun, but as is often the case with these things, is probably the most popular element of the blog post. It was surprisingly entertaining to compose. Im glad that you liked it. More detail about the magnetic signs and the like at a later date. Homage? I thought it was the real deal! Thanks 40kterminatus. Its not terribly difficult to do actually and it was quite a fun process to translate the old design to the new kits. I recommend giving it a go. That is great work! If I were playing more 40k/sci-fi at the moment, I’d be stealing your idea immediately. Oh, man, I didn’t see this coming! So übercool! One medal to the cracking idea and another one to the gorgeous execution! Thanks Suber. This is really just the start of a large terrain project that I hope to work on quite a bit this year. Hopefully there will be more that you like too, even though it is in quite a different style to the inspirational terrain that you have been working on. Most excellent! I gotta steal that. Fire away ccglazier, enjoy. The nature of the Mantic kits made the process quite enjoyable and I would love to see your take on it. That means I’ll have to crack open my Deadzone box now. Ah yes…another project on my table. Cool, looks great. Nice work. HAHAHA OMG! what I love is the band! the fact that they have band posters and an armored and armed tour bus! 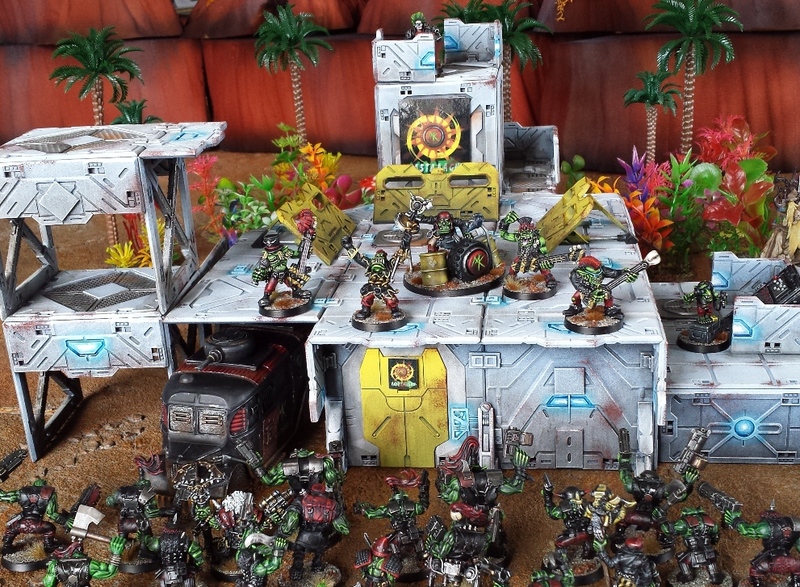 love the details, also love your ork paint jobs! Well done! I have a couple of raised platforms that are 3 x 3 tiles across by 1 x tile high. They dont have roofs as such though, but the 3 x 3 piece is flat and stable. I have a few two storey buildings with removable roofs coming up, but they are 2 x 2 x 2, so that issue isnt present. I am clipping and subsequently glueing the tiles together. If its a large flat piece try to brace it under some heavy books or similar to reduce any potential warpage while the poly cement does its thing. Does that answer your question? Well – yes and no. =) Never mind. I was at it yesterday, clipping and gluing. I bought five boxes of Scenery Upgrade Pack a while back. Bashed up buildings out of two. I have now clipped and shaved all the pieces from all five boxes, glued together most of the three buildings I had already built, and done rought designs for the remaining pieces. A lot of work left, but it’s shaping up nicely. I really like the kits, even if it can be a slight rage catalyst too… =D I will paint when assembled. Any thoughts on that? For larger flat areas adding pieces to brace the areas will help a lot. Imagine the black lines in these images as either half panels or the barrier sized pieces. Arranging them as per A will increase stability and using eight of them (four cut in half) in B will be even more sturdy. Its also worth noting that you can still assemble the buildings with flat roofs if you keep the bracing on the interior. As for painting, scruffy and weathered is a lot more forgiving that trying to go for a clean, Star Trek sort of model. The link to the YouTube painting video in the text of the post sows pretty much exactly how I approached the painting. I will elaborate on my colir choices and a couple of other associated elements in a later post, but honestly the video explains it pretty thoroughly. Zenithal spraying, sponging etc. Seems to be the order of the day. =) I won’t bother with OSL lighting but I must say it looks damn good on those half-panel walls on the “submerged bunker” part of the firebase. The OSL experiement worked better in some places that others, but it does add a visual lift to some fairly grey terrain pieces. The OSL on the “submerged bunker” bit on the side definitely worked out bettger than it did on the other areas. I will wax lyrical about the painting and colour choices at a later date. I considered the method shown in that tutorial myself Mattias, but decided that it was unsuitable for me for a few reasons. That doesnt mean that it wont suit you of course. – Spray inside of building black. – Spray outside of building black. – Quick burst of mid gray on inside. – Bursts of mid gray, from an angle above, on outside. Possibly a very thin umber wash, followed by a very light (and very light) grey drybrush. Finally, some daubing with a sponge to gribble things up a bit. I’m also keen to try tooth brush spattering. I don’t want it to look as run down as Ferrograd, but not as bright as your Firebase either. Something in between, a bit like your ruins maybe? I also don’t want to spend ages “painting” it… I have a history of approaching scenery painting as I do miniatures painting. I can’t “paint the eyes” on my scenery too, that’s just an unnecessary amount of work. Also, I want the whole set uniformly coloured. It’s a settlement built by the same company or government instance – it’s all from the same factory. I think I could get something like that (if not that exact hue of creamy bone) with my approach above. By and large you are talking my language here Mattias. Its important that the terrain looks good, but that doesnt mean agonising over every detail, only some. I have loads of terrain to paint, so the techniques have to be rapid to apply. It also means supplying a rich visual texture via quick techniques like washing, zenithal spraying, drybrushing and the like, rather than sweating too many details. I have attempted large terrain projects before. If there is a lack of contrast in the final product I tend to be unhappy with the results. I apply the same thinking to my toy soldiers, but with terrain high contrast is even more crucial I think. Lack of contrast is why I didnt go for the method as pointed out in your earlier post: even though it has lots of things going for it, that approach is too flat for my tastes. Another factor that I have been very concerned about regards painting terrain grey. Grey is inherently uninteresting of course, plus there is a real risk that terrain painted grey will actually just look like it is primed and awaiting more work unless handled a certain way. I favour high contrast to mitigate that too, plus a fair bit of grubbiness. I considered other colours for the terrain – a dark scheme was very appealing to give a moody, Bladerunner, future noir sort of vibe. I skipped that approach due to having pavement and road mats in two a mid a light grey. I wanted to integrate the terrain with them rather than have them perch on top of it, so grey was settled upon. Many used bright colours for the Mantic terrain, but considering the kits inherent blockiness I avoided that too, as it can often end up looking a little too much like Lego or similar kids toys. I avoided all over washes, deciding to use more targeted washes to increase contrast and visual texture. I also drybrushed after the washes in oreder to… wait for it… increase contrast. Anyway, I will get around to writing more about this soon I hope. You could achieve an approximation of that bone colour with black spray, Army Painter Skeleton Bone spray, a light white spray, some selected washing and some white drybrushing. Nice! I used to own one of those! I try not to get too into the nostalgia aspect of old Warhammer things – I like some old models and some new models, all on their own merits – but it is fun to reference the things that have come before when making new things. It adds to the richness of the experience I think. Very cool! 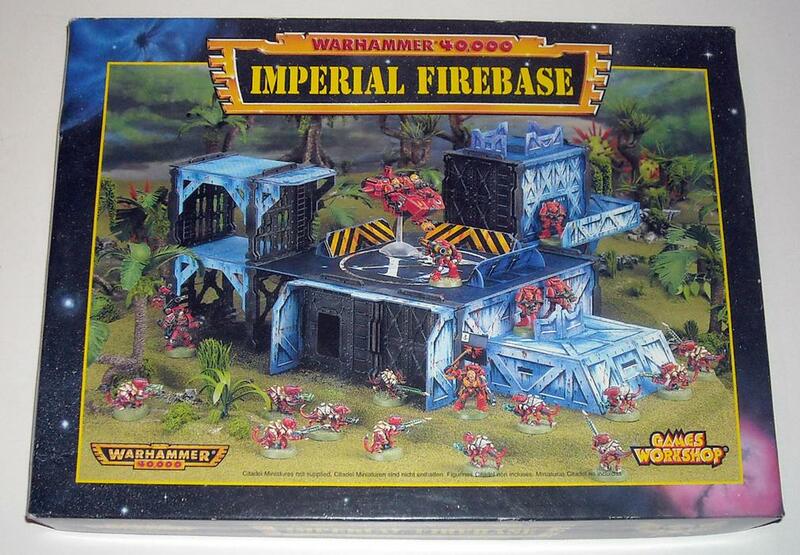 Since I also had an Imperial Firebase, I now feel the need to steal your idea. Could you be so kind as to list the sprues that you used? Or telling me what pack I should buy in the Mantic store. That’d also work. I dont have a list of the sprues that I used. I got a load of sprues in the Deadzone Kickstarter which I supplemented further at a later date, so I cant say what sets will build the model. I will try to make a parts list at a later date, but if it does happen it wont be for a while Im afraid, as I am quite busy with real life as well as hobby things at the moment. I do hope to get around to it Rodrigo, but no guarantees Im afraid. I have a number of extra items competing for my time at the moment, so I dont see that job reaching the top of the “to-do” list any time soon.